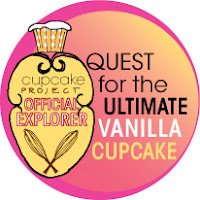 In an earlier blog post I mentioned that I was one of 50 Explorers chosen by Stef at The Cupcake Project to test vanilla cupcake recipes in her search for the Ultimate Vanilla Cupcake. After the Explorers tried baking each recipe we completed a survey in an effort to find a cupcake that at least 80% of us deemed good enough to be called the Ultimate. The first recipe, which my husband, daughter and I disliked so much that frosting couldn't even save them, was given the Ultimate approval rating by only 29% of the Explorers. We eagerly awaited the arrival of recipe #2. The second recipe required the use of a vanilla bean. This was a new experience for me, so I watched a YouTube video to see exactly how one harvests the vanilla from inside of a vanilla bean. It is a bit of a tricky process, with the vanilla sticking more to my knife and my fingers than I was prepared for. Regardless, this recipe was amazing! All three of us loved these cupcakes, and the highest compliment I can pay is to say that they did not even need frosting. And I love my frosting! I was certain that this recipe would be IT. Imagine my surprise when only 36% of my fellow Explorers agreed with me. I wondered how in the world Stef was going to improve on perfection with the next recipe. For the third recipe we again used a vanilla bean, which was great because I had ordered a package of six beans online and had no idea what I would do with all of them. Katie had already left for South Korea at this point, so only Jim and I did the taste testing. While the cupcakes were very good, we did not feel like they held a candle to recipe #2. Again I was surprised when 66% of the Explorers thought that this recipe was the Ultimate. At this point Stef had to decide whether she would ever get 80% of us to agree on a recipe. Considering that we all have different pans, ovens and brands of ingredients, not to mention taste preferences, perhaps 80% was an unrealistic goal. In the end she decided that if 2 out of 3 of us thought this recipe was the Ultimate, that was good enough. Recipe number 3 was crowned as king of vanilla cupcakes, and you can find the recipe here. While I am disappointed that my personal favorite was not selected as the best, I am very happy that I participated in this search for a great vanilla cupcake. Cupcakes from scratch no longer intimidate me, and I am eager to try some of the other fantastic recipes out on the Internet. So for now, Wolter the Explorer signing out. that's so cool! you were part of this too??? ?